You may have noticed fewer posts from me over the last few days. That is because I was away with my husband on a trip to Western Australia's Southwest region. 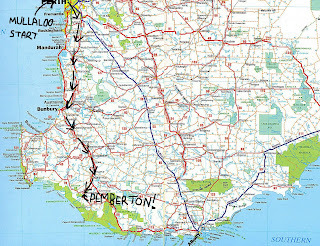 We drove 353 km from our house in Mullaloo to the little town of Pemberton. We left on Friday afternoon. I was very excited, as it felt like an adventure. Graham seemed happy too. We drove for several hours. Well, Graham did. I can't drive. It was dark before we reached the caravan park where we had booked a small cabin. Even in the dark we could tell it was clean and tidy, and we appreciatively gloated over our good fortune before making the double bed and falling asleep. Poor Graham. I was so excited about exploring that I woke up early on Saturday morning. To be fair, when I woke him, I did sweeten the blow with pancakes, but I think he was still sleepy! At my insistence, we ate quickly and got ready to drive out in search of adventure. We decided we would travel to the Valley of the Giants, which we were assured was only an hour and a half drive away. The sun was shining, the air was beautiful and clean, and we were ready to take on the bush! So it was a surprise when a sign declared the road closed due to flooding of a river. Oh well, never mind. Surely there is an alternate route? The GPS declared there was... one that would take us several hours to traverse. Undeterred, we decided to keep going. The southwestern area of Western Australia is stunning. Tall karri trees are skirted by lush scrub and ferns. Graham and I sat back and drank in the breathtaking views. 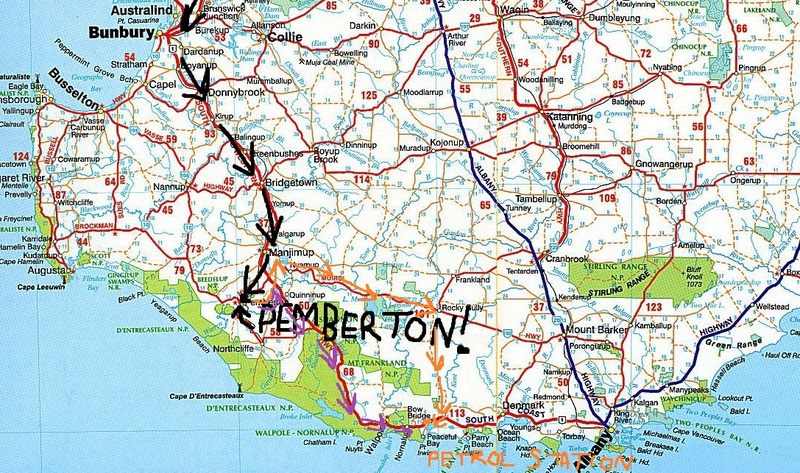 We got ever closer to our goal, until the GPS turned us down one last road. 70 kilometres and we were there! The road had no lines, but it was wide and sealed, so we started driving. Then the road turned into an unsealed road. No worries; it was still wide and graded. Until finally we were driving along a sandy death-trap suitable only for tractors. Graham suddenly spoke up. "How long is it until we get to the end of this road?" "Because we are close to running out of fuel. We need to get off this track and find a petrol station." "We actually don't have enough petrol left to do that." We started to get nervous. Then the GPS went silent - it had no idea where we were any more. Visions of being stranded in the bush, with no petrol and no phone reception began to flash before my mind's eye. Graham looked just as scared. And then, oh joy of joys! We got to the end of that horrific road! And only a couple of hundred metres away there was the most welcome sight - a roadhouse and petrol station. We filled the car and bought a map. As we relaxed outside the roadhouse we realised just what had happened. 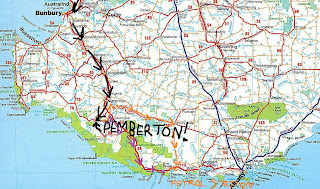 The GPS had sent us on a huge 500 km trip, when there was a highway that would have gotten us there in half the time. The orange arrows are the way we came. The purple marks the easy way the GPS inexplicably missed. Perplexed and frustrated, we checked our map again. We were only 13 km away from our original destination - the Valley of the Giants. We decided to go and visit it, as we had come so far to do so. The Valley of the Giants is an untouched part of a National Park, famous for its forest of tingle trees. These trees are over 40 metres tall, and more than 400 years old. The rangers have built a huge and very high walkway among the ancient trees. We climbed up the walkway and found ourselves walking through the treetops, 40 metres above the ground. It was beautiful, and all our worries melted away as we explored the forest. It was beautiful and majestic. Eventually, refreshed and happy, we set off back to the caravan park. 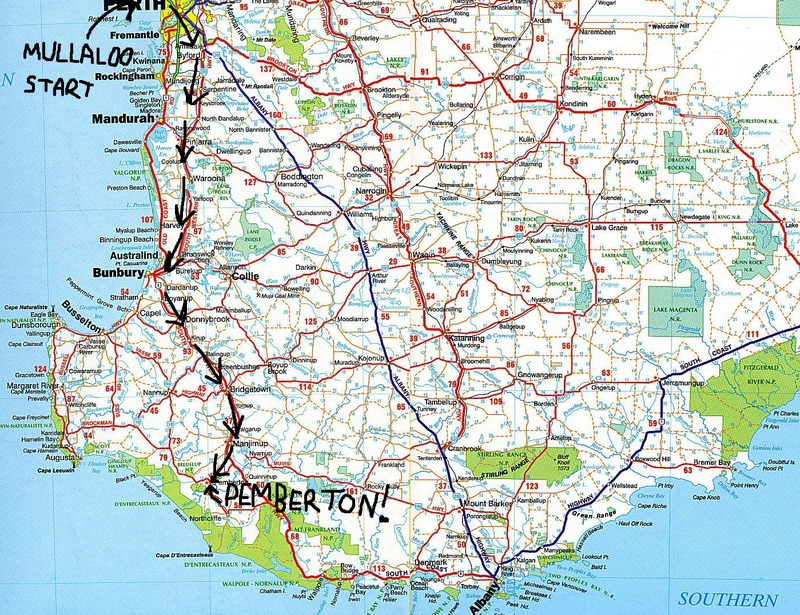 I packed away the offending GPS and we navigated the old-fashioned way... by map. And it was easy, and took less than half the time to get back than we had spent trying to get there! We had a lovely trip away. But I now hate that GPS, and have sworn to destroy it in some way. Any suggestions on methods welcomed! Yeah your GPS sure is interesting, actually the reason I dont want to get one :P. Sounds like an awesome trip though! It was great! Next time we'll invite you and Ashlee to come too!